Tire Pros is the largest growing group of Independent Tire Dealers in the country and comes with countless benefits for our customers. 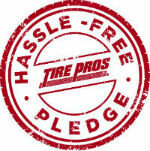 Our goal is to take care of our customers and Tire Pros enables us to do just that! As one of the largest networks of independent tire retailers in the US, Tire Pros offers customers the unique combination of local ownership and national buying power we save you money without compromising quality. With over 700 locations nationwide, you're never too far from a Tire Pros store. And with our coast-to-coast service warranties, you're covered with our network of over 30,000 service centers across the country. Hassle Free Guarentee! Whether you need tires for your pick-up, SUV or luxury sedan, Tire Pros has what you need. We carry the world's most respected tire brands including Michelin®, BFGoodrich®, Continental, General, Goodyear, Dunlop, Kelly, Bridgestone, Firestone, Nitto, Kumho, Capitol and many more. Our knowledgeable professionals understand high performance ratings and performance characteristics. We have the state-of-the-art equipment to care for your custom wheels and the technical expertise to ensure a proper installation. We're specially trained on tire pressure monitoring systems and run-flat technology. Our people are experts at a wide variety of automotive services - including brakes, shocks, lube & oil changes, batteries and more. We are also one of the few tire dealers who have the specialized equipment and training required to perform wheel alignments. We even offer smog and A/C services.